Have you been enjoying the hot weather? We here at Push Square Towers have been slowly melting for most of the summer, but IO Interactive wants to turn up the heat. The studio has announced the Hitman Summer Pack, which essentially gives you access to the game's third level, Marrakesh, for free. Also included is the ICA Training Facility, and both areas come with their full suite of content. In other words, the Summer Pack's two locations offer a couple of story missions, over a hundred challenges to complete, a handful of trophies, 10 of the challenging Escalation Contracts, and more. If you fancy picking the full game up afterwards, your progress will carry over. Marrakesh isn't Hitman's best level, but it's a generous package nonetheless, and will give you plenty to do if you've yet to sample IO's excellent assassination sandbox. The Summer Pack is available until 31st July. 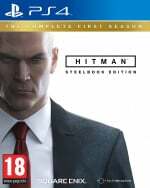 Will you be taking a trip to Marrakesh with Agent 47 this month? Don't forget the sun cream in the comments below. Are you a Moroccan or a Moroccan't? I have already gotten the Paris and Sapienza levels from when they were free, so it's nice to add this to the collection, too. The Paris one has kept me busy for more than 10 hours and now I am taking a break before giving Sapienza a try. I can see why they went with the episodic route. Do you need the base game for this?